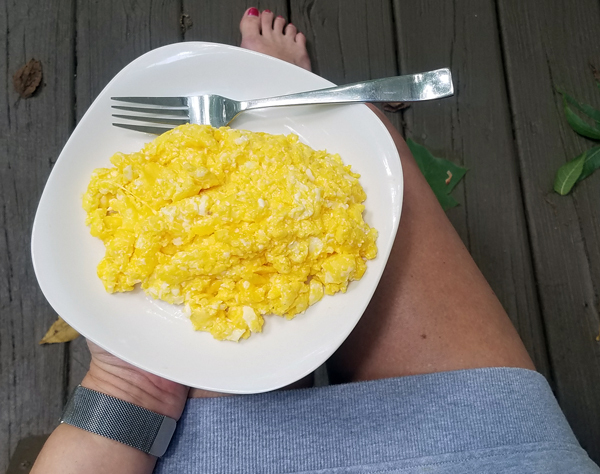 As we head into the weekend, I wanted to give you a photo tour of my low carb week. 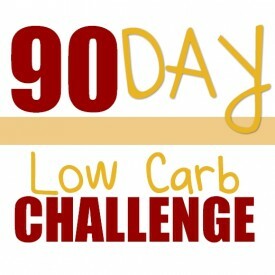 It includes 6 full days of low carb meals, simple snacks and keto friendly restaurant options. 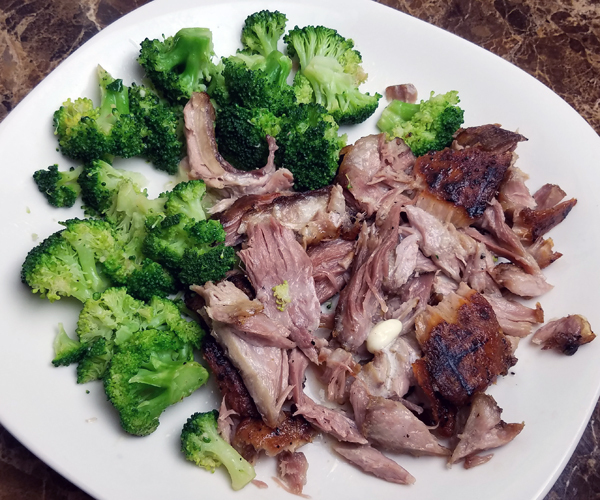 I shared 8 days of low carb meals & Myfitnesspal logs followed by the next 4 days of meals & macros, and then my Monday Weigh-In here. I had lost 4 pounds in two weeks up to that point. 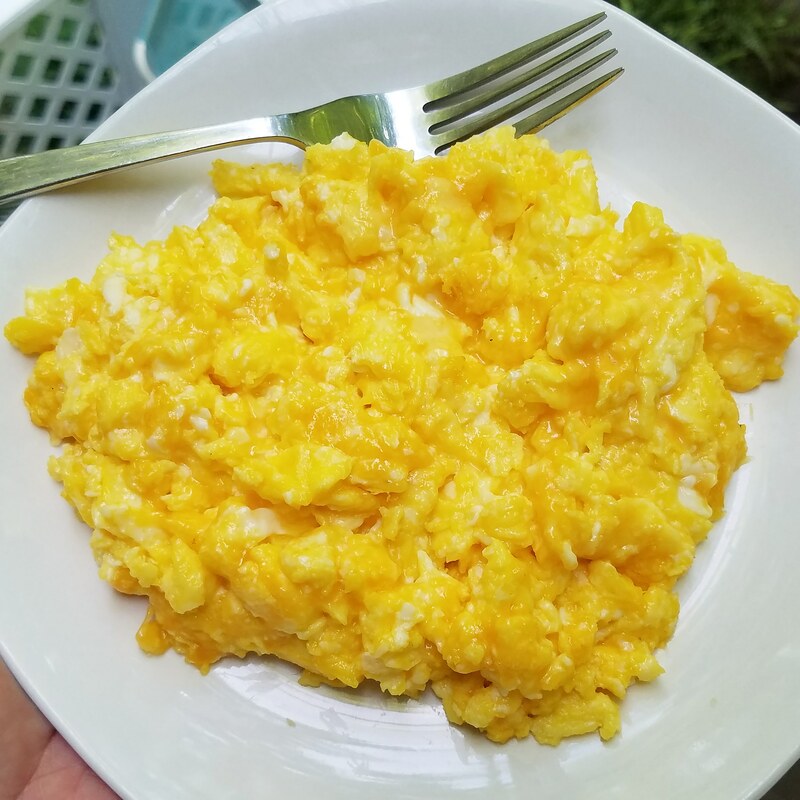 I kicked off the day with a late breakfast of cheesy eggs: 4 eggs scrambled in butter with colby jack cheese. 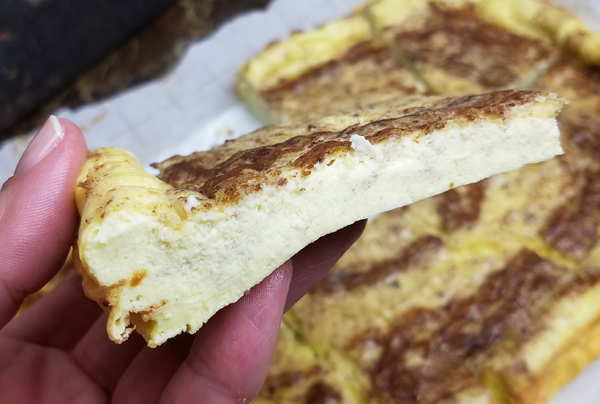 That night I made the Egg Loaf recipe and I had one piece of it before putting away the rest to make french toast the next morning. 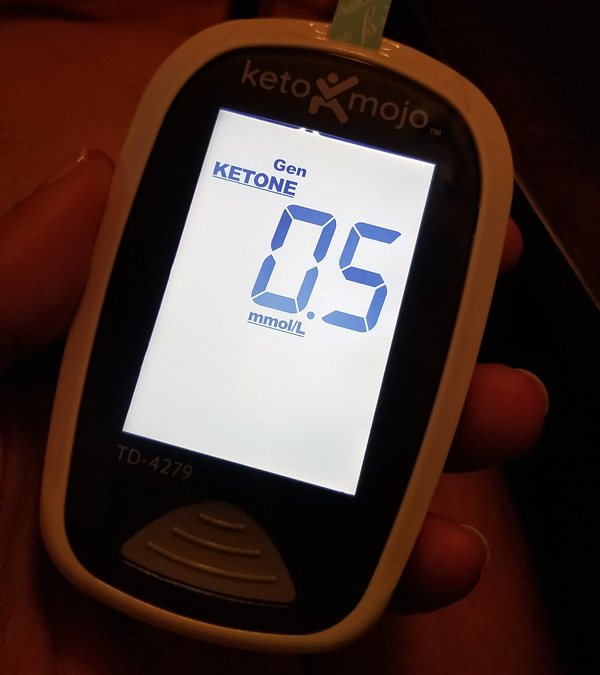 Later that night I felt slightly hungry and grabbed the “FatFit.Go Tropical Margarita” fat pack that came in this month’s Keto Krate box. 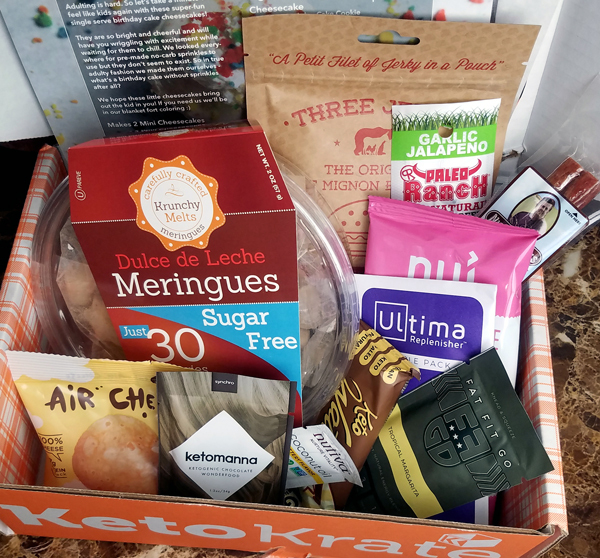 This is what the July Keto Krate box looked like – there were 10 other products too, plus the FatFit.Go packet. I also had 5 coffees on Saturday, which added 5 more carbs to my day. 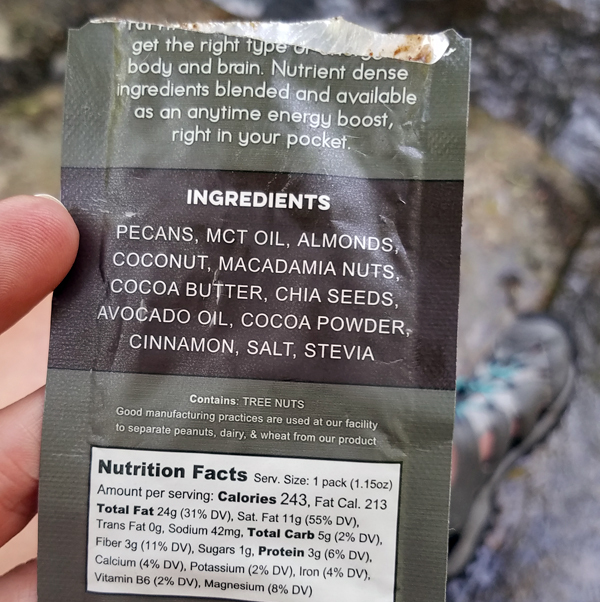 I use sugar free Coffee-Mate powdered hazelnut creamer. 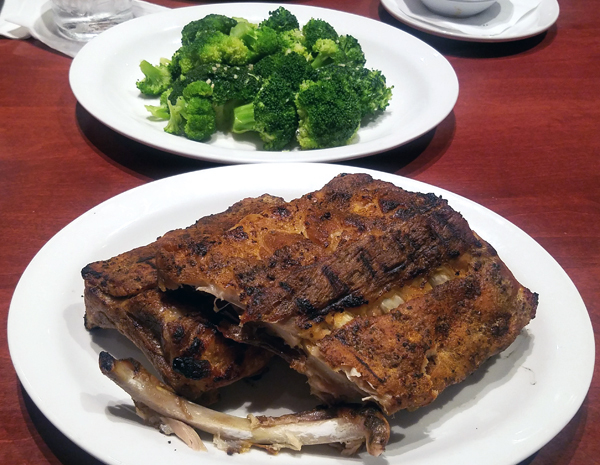 I’d been craving ribs, so I went out to Cheddar’s (now called Cheddar’s Scratch Kitchen) which always has GREAT food and really good portions. 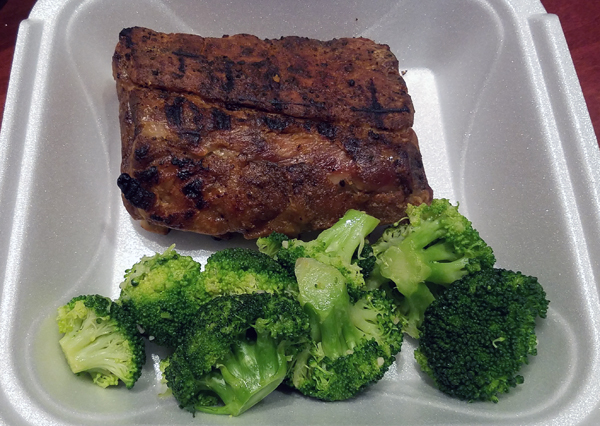 I ordered a full rack of ribs (no sauce, please) with double broccoli. There’s no way I could eat all of that in one meal of course, so I brought half of it home with me to eat for lunch the next day. 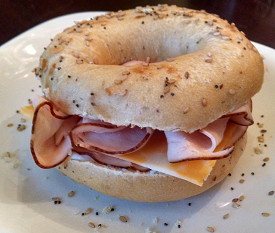 Monday was a super busy work day so I just grabbed a quick snack I could eat at my desk. 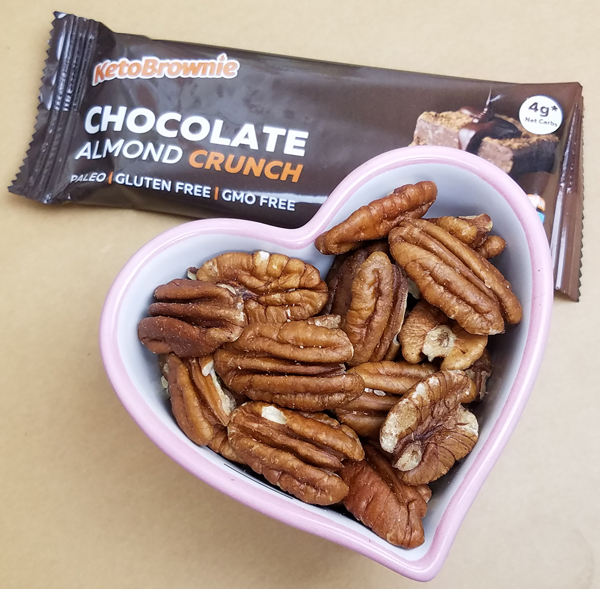 I had one of the original KetoBrownie keto bars with 1/2 cup of pecan halves. 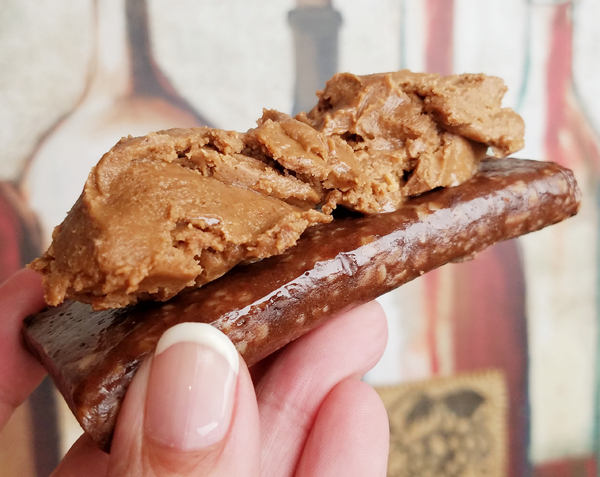 They don’t make these bars anymore, but their new Keto Brownies & Blondies are awesome! That made for a VERY filling and delicious lunch! I wasn’t hungry again until later that night, and ate the last two French Toast Sticks that were leftover from Sunday’s fun brunch. 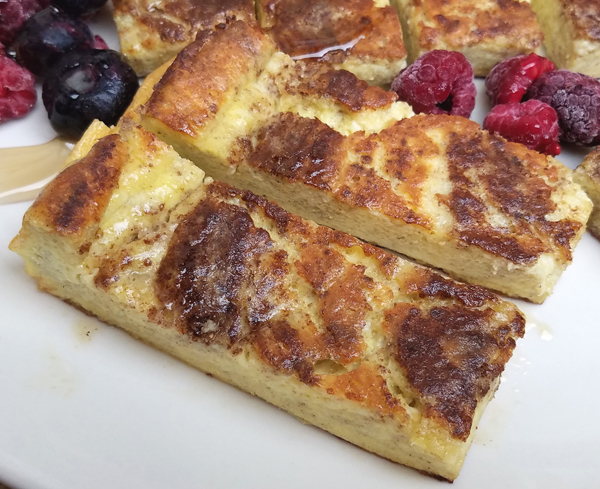 I just ate them plain – and they were delicious without any berries or syrup or anything! 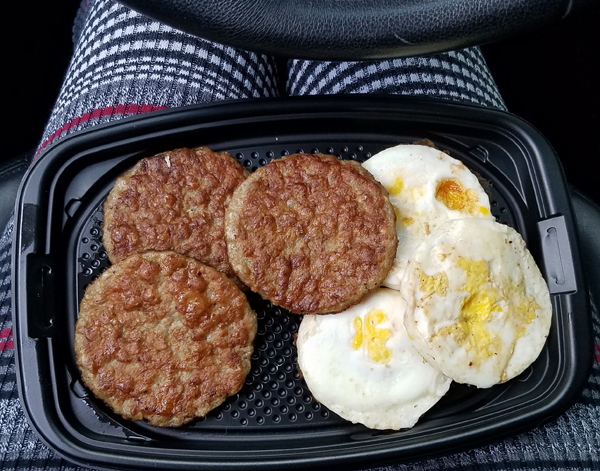 I had a Buy One Get One Free coupon for McDonald’s that was about to expire, so I grabbed that for breakfast on Tuesday while I was out running errands. 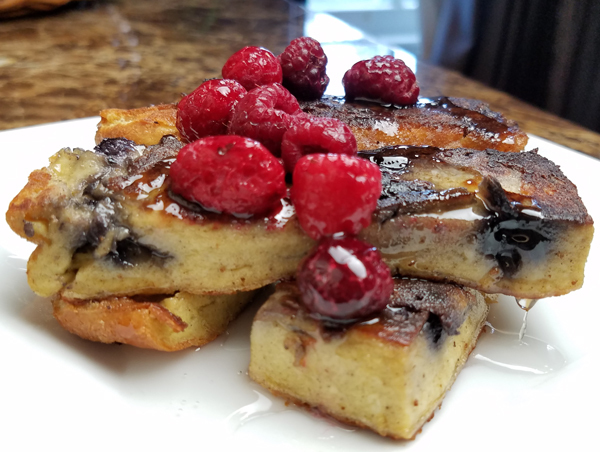 I topped those with raspberries (just 18 grams) and drizzled it with a TBSP of the Vanilla ChocZero syrup. 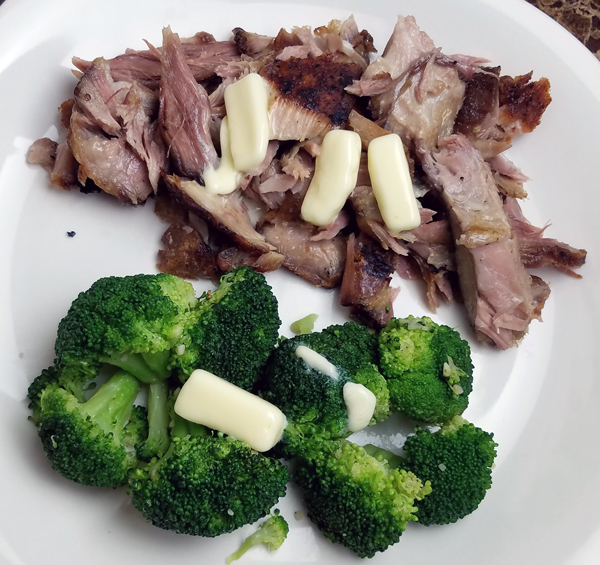 Such a ridiculously good combination to be so low carb!! I only really had those two big meals, but that was a lot of food (to me). 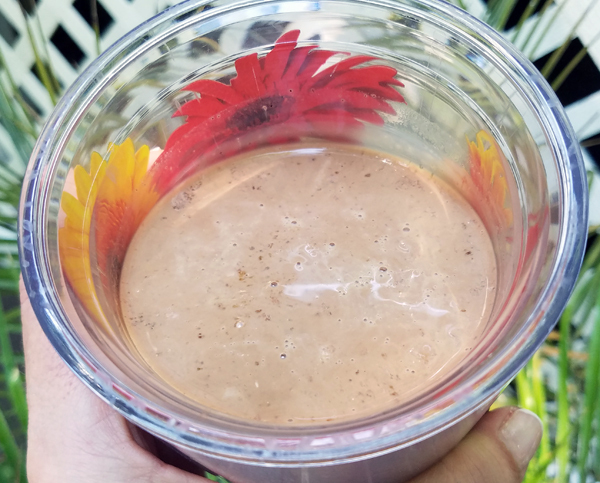 I did have a Chocolate Ketologie Shake in the late afternoon / early evening, which I stuck in the freezer for a bit to make it more like a milkshake. Great afternoon pick-me-up! 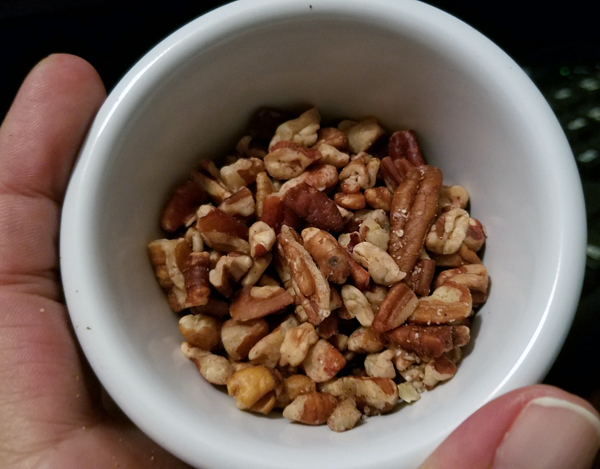 Later that night I had a serving of pecan pieces while wrapping up some work. 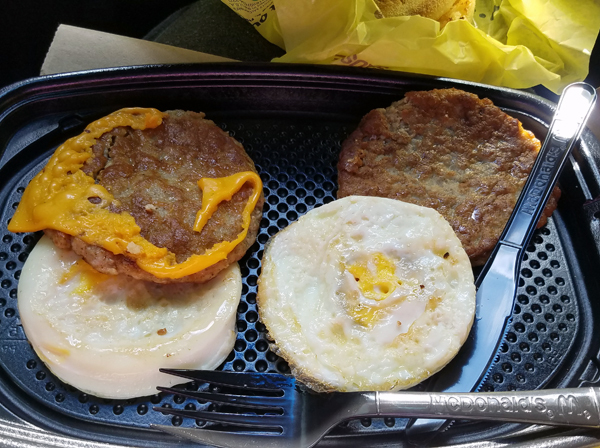 I just needed a quick bite is all. Do you do that too – weigh/measure out ALL of your portions?? 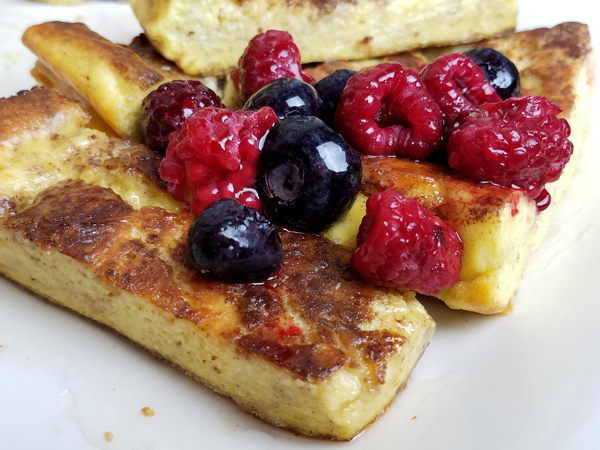 I ate the last 4 Low Carb Blueberry French Toast Sticks that I made the day before for breakfast, and just ate them plain this time – warmed up a little, that made a perfect quick & delicious breakfast! 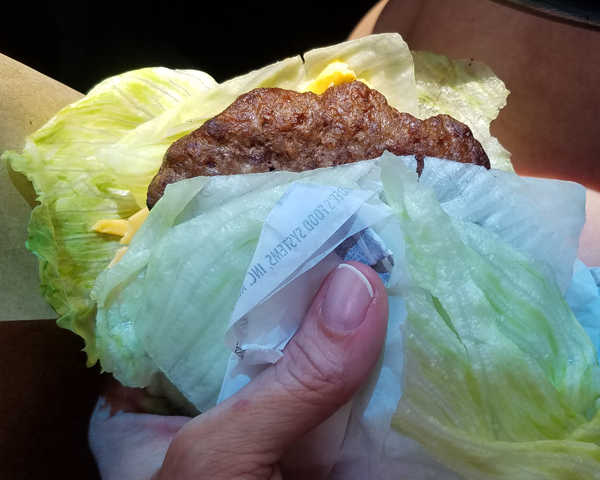 I worked that morning, then headed out after lunch to get in a quick hike – and grabbed a low carb burger on the way. You can watch this video to see what an amazing afternoon it was! I had a waterproof phone case of course. 😉 You can see the float & case, and what I carried in my pack here. 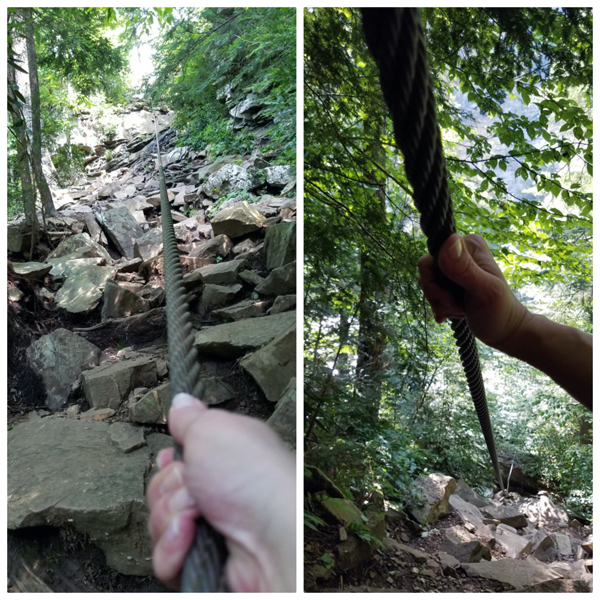 I brought a few snacks with me since I wasn’t sure how long I’d say out, or how long that burger would hold me over on such a strenuous climb. I actually WAS famished by the time I climbed back out! 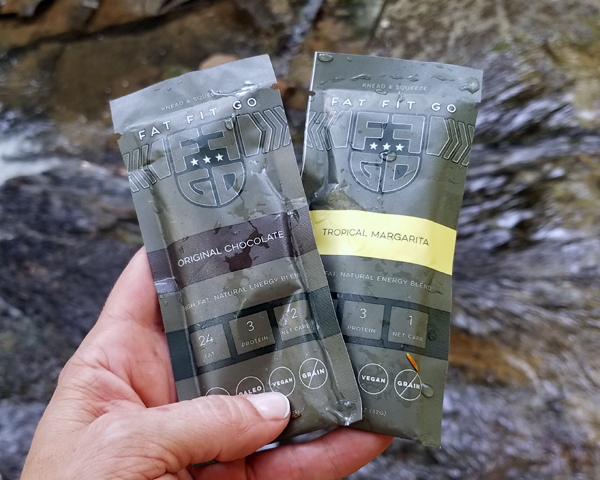 I had two of the FatFit.GO fat packs, one in each of their flavors, so I sat down by the river (that flows over Rockhouse Falls into the hole) and ate both of those to fuel back up for the hike out. I have lots of different brands/flavors of these types of fat packs. I need to take one entire day to just do a taste-testing comparison between them all. I was wiped out by the time I hiked out and drove the hour home. 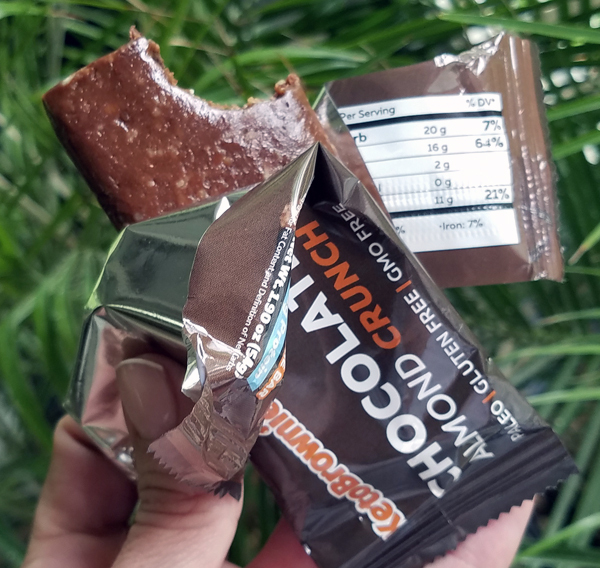 I should have stopped and picked up dinner, but I didn’t – so I just grabbed one of the keto bars and called it a night. 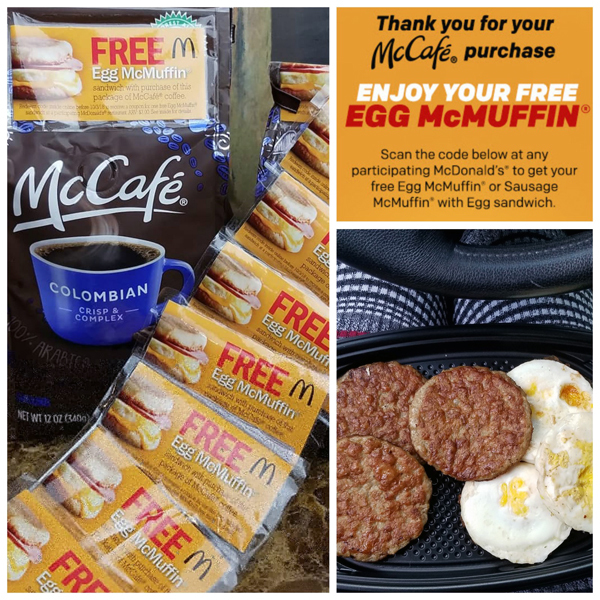 Lately there have been coupons for a free McMuffin sandwich on the McCafe coffee I buy, so I’ve been saving those up. You just enter the code online and it emails you a code to scan. 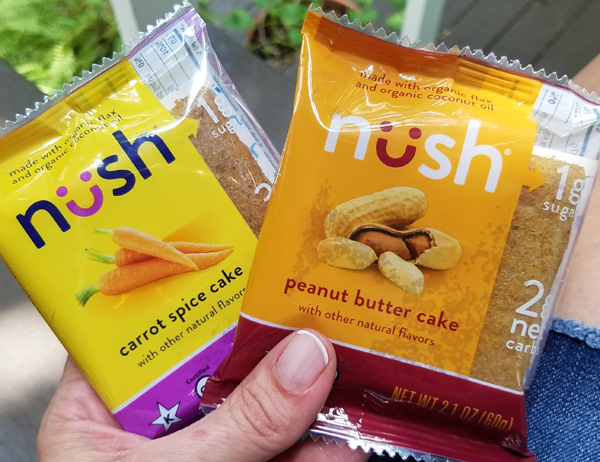 I had lunch plans that day but they fell through, and I ended up having to get back to work pretty quick… so I just grabbed two of the new NUSH cakes and called that lunch. I was wiped out after my big hike the day before! 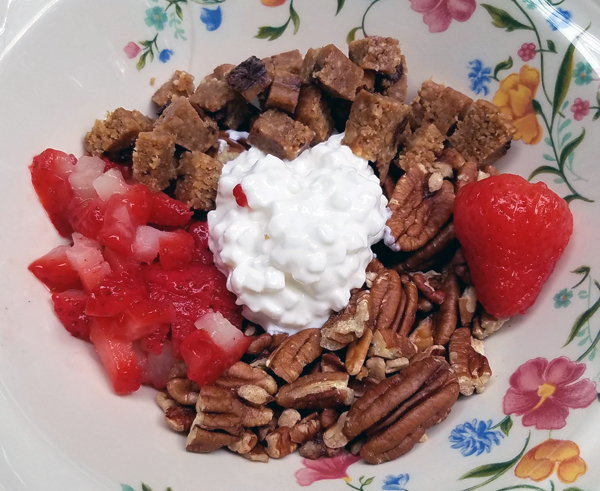 For breakfast I had my usual “pecans, cottage cheese & strawberries” bowl but this time I chopped up a Keto Blondie in it TOO which made for a nice change! 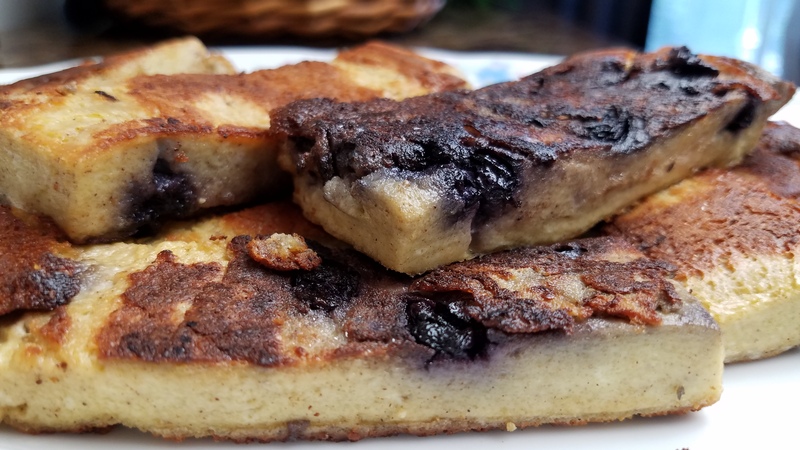 I was actually JUST going to eat the Keto Blondie – and figured I better add in some healthy foods with it too, lol. For lunch I made chicken sausage & cauliflower rice, which was a super quick one-skillet meal – with leftovers to enjoy later. That’s actually been the case for the last couple of months. 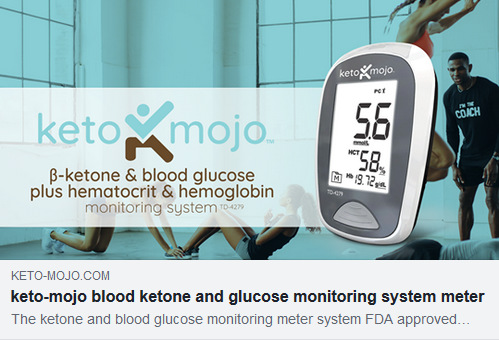 The urine strips show I’m at higher ketone level, but they’re historically unreliable – and blood testing is WAY more accurate, for a lot of reasons. I’ll get more into the technical side of that in another post, along with things I plan to test and all the good things I’m learning about what your level SHOULD be, when/why it fluctuates, etc etc etc. The IMPORTANT thing is that I’m consistently exercising again, getting out for my FUN hikes again, finally have my appetite back AND I’m dropping weight again. All good things! So my last weigh in was 145.4 pounds – which is a full 10 pounds above my lowest weight a year and a half ago, but only 5 or 6 pounds up from my “happy weight” (where I feel best). Right now I’m less concerned with the number on the scale, and more focused on my overall health & well being. Being so down and being so sick is the PITS, so my focus is on FEELING GOOD and letting the scales follow suit! I am feeling the same way…it’s more about how you feel than the number on the scale! I am about 10 lbs heavier now too and feel so much better around 138 lbs but I am trying not to panic and just do the things I know have worked before and hoepfully it will all fall into place. Even though you haven’t been feeling the best earlier in the year you always look great! Thank you so much, Amanda. 🙂 I have been a bit hard on myself for letting my arms get so out of shape and other things. We both know what it takes to get where we want to be, and how GREAT that feels – both the getting there and the BEing there, but even just working toward it feels great! So… let’s make this happen. 🙂 *cheers* Thank you for the encouragement & kind words today!! I absolutely love the food scale you recommend as well as the bathroom scale…. IF anyone needs/wants something different, these are 2 of the most reliable scales I’ve ever owned!!! You can weigh yourself 5 times and get the same result. 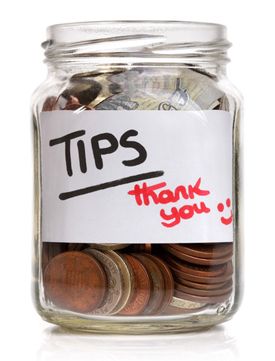 Glad to hear you doing better:) I haven’t seen anything lately in your reviews about the Know products. 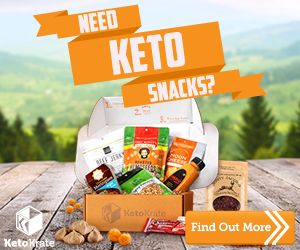 I love the cookies and was wondering if you still recommend them or eat them? Or do you have any news about any new products from them? I tried the pancake mix and love it too. Luckily I purchase the pancake mix at whole foods close to where I live but haven’t found a retail outlet for the cookies. Shipping is the biggest cost wish they would run a deal. Loved it when you would share their promo codes. Well, just wanted so Hi and am glad your doing better. I am in maintenance with my weight and feel great. I fluctuate a few pounds but staying stable. They came out with a few new things I believe, so I look forward to reviewing those soon!